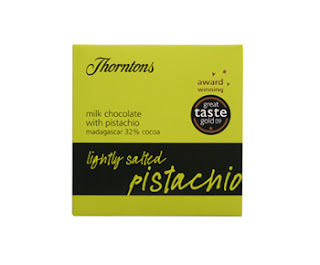 As my last Thorntons chocolate block giveaway was popular, here's your chance to win a yummy Thorntons Lightly Salted Pistachio Milk Chocolate block. From the Gourmet Chocolate block collection this is a 80g block of top quality milk chocolate. This melt-in-the-mouth creamy chocolate from Madagascar (32% cocoa) has been given that extra crunch! Vibrant, lightly salted pieces of roasted pistachio have been added to create the perfect balance between silky sweet and subtly savoury. I know salt with chocolate may sound a little odd, but this really is delicious. The milk chocolate is really creamy and smooth and the nuts really complement it. It honestly is yummy - in fact I don't really know why I'm giving it away! At just £1.89 for a 80g block (or 3 for £5) why not try a new chocolate experience today? Sounds weird but chocolate is chocolate right. Sounds lovely. Not tried and would love to. Following you on twitter, and have tweeted the competition.